Odds are if you have landed on this page you need to have some gutter cleaning done on your Plymouth, MN home? Well gutter cleaning is a very important service item on your home so that you ensure you don’t get water damage to your basement and roof system. Gutter systems are designed to carry water away from your home; a dirty gutter system will mean water can spill over the gutters and straight down to the ground where it can pool up against the foundation system. While cleaning the gutters on your Plymouth home we ensure each section is free of debris, we will hand clean each section and bag it for removal upon completion of the job. We will ensure your gutters are flowing properly so that water is carried away from your home like it was designed to do. How will we clean the gutters on your Plymouth home? Well gutter cleaning for River City is a hands on job and we clean each section of your gutters by hand scooping the debris into trash bags to be hauled away with us at the end of the job. After we are done cleaning the gutters out it is time to flush the gutter system to make sure everything is working properly and the water is draining. We make sure all the downspouts are cleaned too. When should someone in the Twin Cities get their gutters cleaned? Well it depends if you are doing preventive work or spot treatment on your gutters. We recommend to correct the problem before the issue starts, this means cleaning your gutters in the fall after the leaves have left the trees or in the spring after the gutters have thawed out. The only downfall to doing it in the spring is often the rains come before the gutters can be cleaned and you risk damaging your home until they can be cleaned. Is there anything else River City Home Solutions LLC should do for me while they are at my Plymouth home cleaning gutters? Well one of the downsides to cleaning the gutters is when we hose out the gutters the water often gets on your windows. We offer a “quick” window clean for our gutter cleaning customers after we are done. This “quick” clean is not as detailed as our full cleans, but at a fraction of the cost you will be happy with the value! What must the homeowner do the day of the cleaning? The only thing I need from you is exterior water to be turned on so I can flush the gutters when cleaning. Other than that I don’t even need you to be home. How do I get my gutters cleaned? Well the first step is to fill out our contact form making sure to leave me a full address. Next, usually within 24 hours I will swing by and give you a free estimate. Once you have the estimate it is up to you to contact me back to let me know to go ahead with the work and we will get you on the calendar. Simple as that! Window Cleaning – We clean the windows on both inside and outside of your home, we also clean screens and wipe/vacuum sills and tracks to ensure proper window function. 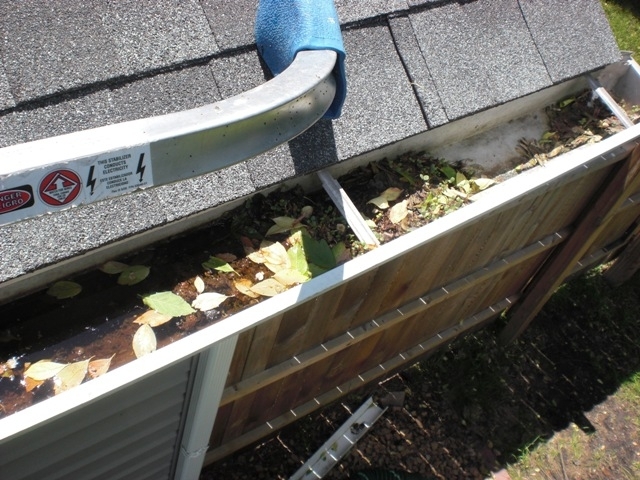 Gutter Cleaning – We will hand clean each section of your gutter system to ensure proper flow of water. We will also report any issues with your gutters, roof, and home in general relying on my 10+ years of residential experience in which I built hundreds of homes in the Plymouth, MN area. Pressure Washing – We can make that old deck look great again getting it ready for a new coat of stain/sealer. We also wash entire homes, patios, screened porches, sidewalk, and driveways.